Objective:The resident will develop a high degree of efficiency in the provision of primary eye care services. Outcome:The resident will provide primary eye care services involving a minimum of 1000 patient encounters, 50% of which will include obtaining a case history, visual acuity, refraction, tonometry, and external and internal ocular health assessment during the encounter. Goal 3: Expand the resident’s knowledge of specialized diagnostic instrumentation. Objective 2: The resident will develop expertise in interpreting posterior segment imaging techniques including fluorescein angiography and OCT. Outcome: The resident will observe ophthalmic fluorescein angiography and interpret the results and perform OCT and interpret the results. Objective 4: The resident will develop expertise in ordering and interpreting relevant laboratory and radiology procedures. Outcome: The resident will order and/or interpret laboratory and radiology procedures on at least 25 patients. Goal 4: Enhance the resident’s knowledge of low vision care. Outcome: The resident will evaluate and manage at least 30 patients with limited sight. Goal 5: Increase the resident’s knowledge of systemic diseases and their treatment. Outcome: The resident will participate with non-optometric providers in management of patients with systemic disease. The resident will observe clinics with other medical providers. Outcome: The resident will present lectures during conferences and other meetings held at the Mountain Home VAMC and when possible will present posters or lectures in other settings such as the American Academy of Optometry and SECO. Goal 7: Instill in the resident an appreciation of the importance or scholarly activity. 1. Primary eye care procedures, including routine examination, diagnosis, and treatment of vision disorders. 2. Diagnosis and treatment of ocular disease, using full scope of diagnostic testing and pharmaceutical intervention available at this medical center. 5. Enhancing the residents knowledge of low vision care. 6. Systemic associations with ocular disease, and the procedures for diagnosis and treatment of these systemic conditions. 7. 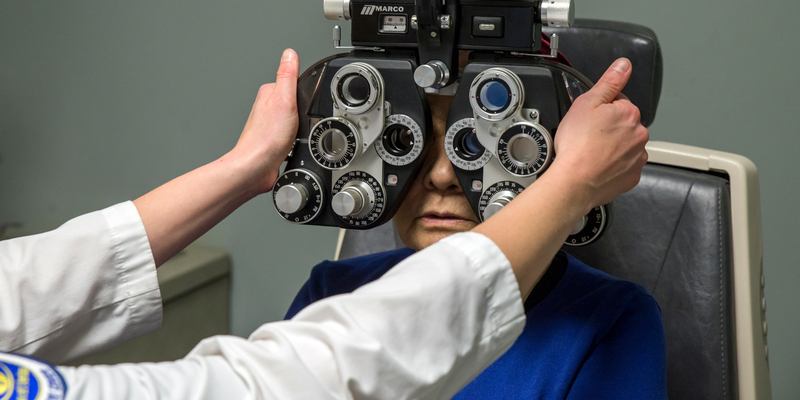 Utilizing optometrists as gatekeepers into the health care system by appropriate interaction with a referral to other health care providers as needed for the total management of the patient. 9. The residency program will encourage the residents to enhance the existing optometric literature by requiring at least one paper of publication quality to be written during the residency. A. The resident will, at the completion of the residency, have directly provided eye care to a substantial number of patients, a significant percentage of which presented with ocular and / or systemic disease. This experience will enable the resident to independently provide full-scope primary eye care at the highest level. B. The resident will, at the completion of the residency, have directly provided eye care to a substantial number of patients requiring low vision services. This experience will enable the resident to independently provide intermediate level low vision services. C. The resident will, at the completion of the residency, have coordinated the care of a significant number of patients with the VAMC ophthalmology service. This experience will enable the resident to effectively assume a significant role in the co-management of patients with ophthalmologists. Each residency is one calendar year in length, commencing July 1. The resident is eligible for thirteen days annual leave. The resident is also eligible for educational leave to attend approved professional meetings. Annual and educational leave is granted with prior approval of the Supervisor and the Associate Chief of Staff for Ambulatory Care, in conjunction with the SCO Director of Residency Programs. Residents are also eligible for 13 days per year of sick leave. A. The resident is defined as an employee of the Mountain Home VAMC and the residency stipend is paid by the VAMC. No tuition or fees are applicable. B. The resident should for apply for optometric license in at least one of the fifty states prior to the beginning of the residency. C. Professional liability protection for residents for work done at the Mountain Home VAMC is provided under the Federal Tort claims act. D. Residents will have access to Southern College of Optometry facilities such as the library. E. Residents will be required to present credentials according to the Mountain Home VAMC policy for credentialing of residents. F. Residents privileges will be determined by Mountain Home VAMC policy. A. The resident is required to deliver clinical services at a level that is satisfactory to the Residency Supervisor, Director of Residency Programs, and the SCO and Mountain Home VAMC administrations. Normal clinic hours are from 8:00 A.M. until patient care is completed, usually around 4:30 P.M., Monday through Friday. The resident is expected to be present during all working hours, except attending conferences and doing study or research. Since the Optometry Section is not responsible for on-call services the resident will not be required to be on call. E. The resident is expected to perform in a professional manner in the delivery of patient care services and to observe those proprieties of conduct and courtesies that are consistent with the rules and regulations governing Mountain Home VAMC. H. Any resident accepted for training can be dismissed, without receiving a certificate of completion, for infractions of the rules and regulations of the Mountain Home VAMC or those set forth by Southern College of Optometry, or for any action which jeopardizes the safety of patients, personnel, or physical facilities. A residency stipend will be provided for the year of training paid by Mountain Home VAMC. The stipend is currently $34,888. Compensation is not contingent upon productivity of the resident. Additional benefits such as FICA and insurance are also funded. Optional health and life insurance benefits are also available through the VAMC. The residency program at Mountain Home VAMC is fully accredited by the Accreditation Council on Optometric Education, 243 N. Lindbergh Blvd., St. Louis, MO 63141, 314-991-4100.